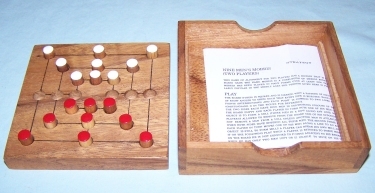 This game of Nine Men’s Morris has a history that is probably as long as any board game. The name morris is a corruption of merels from the Latin word for counter. Merels has been played in many forms for over 3000 years and was particularly popular in the middle ages, the version given is perhaps the best known. Comes with all wood construction of the box and pieces. Instructions are included. It is a perfect game for two.